“We’re making a little bit of progress. I still think we’re leaving a lot out there. We’re not playing as good as we could or should but we’re making progress.” — Ben, on the offense. Ben completed 5-of-9 passes for 81 yards, one touchdown, and an interception in Sunday night’s preseason game against the Colts. He is now 12-of-17 for 130 yards, one touchdown, and one interception through two preseason games. Charlie Batch replaced Ben a little more than half-way through the second quarter, and after leading a 12-play drive ending in a field goal, Charlie was replaced by Jerrod Johnson who finished the game. “Well, we were in the huddle and I had to call the play. I had a two-way option and I gave it to him. I thought he’d get the first down, and he ended up getting a little more.” — Ben, on the touchdown pass to Antonio Brown. As they did in Philadelphia, the Steelers scored on a 57-yard touchdown that began as a short pass. Antonio Brown took the pass from Roethlisberger with Heath Miller and Leonard Pope blocking in front of him. 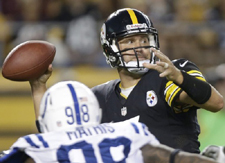 Roethlisberger and his first-team offense bowed out after four possessions in the first half. Batch replaced him with 9:16 left in the second quarter. You can read more post-game here and here. You can check out a few photos here. According to the Pittsburgh Business Times, “The Pittsburgh Steelers’ primetime preseason game brought a victory not only to the Steelers against the Indianapolis Colts but also NBC, which carried the telecast Sunday. You can read more on the list from ESPN North Blogger Jamison Hensley here. “You get in the huddle, everyone listens. They’re guys you want to play for and protect.” — David DeCastro on taking the field with both Ben and Andrew Luck, from an interview in the Pittsburgh Tribune-Review.